Proteases from bacteria are among the most important hydrolytic enzymes that have been studied due to their extracellular nature and high yield of production. Of these, alkaline proteases have potential for application in detergent, leather, food, and pharmaceutical industries. However, their usefulness in industry is limited by low activity and stability at high temperatures, extreme pH, presence of organic solvents and detergent ingredients. It is therefore very crucial to search for new alkaline proteases with novel properties from a variety of microbial sources. 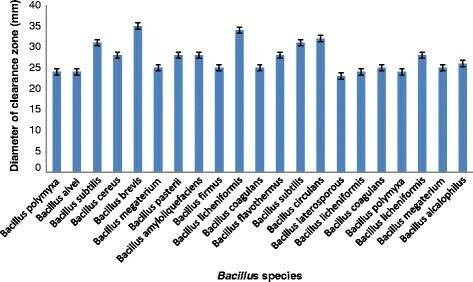 In the present study, 21 Bacillus species isolated from organic waste sites were screened for proteolytic activity on casein agar. Bacillus brevis MWB-01 exhibited highest proteolytic activity with a clear zone diameter of 35 mm. Production of protease from B. brevis MWB-01 was investigated in optimized media after 48 h of cultivation with shaking (180 rpm) at 37°C. The protease was partially purified in a two-step procedure using ammonium sulphate precipitation and gel filtration chromatography on Sephadex G-200 column. The enzyme was purified 2.1-fold with yield of 4.6%. The purified protease had optimum temperature of 40°C with relative activity of about 50% at 50°C and was uniquely stable up to 60°C after 30 min of incubation exhibiting 63% residual activity. The enzyme had optimum pH of 8.0 and remarkably showed relative activity above 70% at pH 9.0 to 11.0 and 53% at pH 12.0, respectively and was very stable over a wide pH range (6.0 to 12.0). Ca2+ and Mn2+ increased protease activity with 9.8% and 3.5%, respectively; Hg2+ and Zn2+ strongly inhibited protease activity by 89% and 86%. The almost complete inhibition of the enzyme by phenylmethylsulphonyl fluoride (PMSF) and ethylene diamine tetra acetic acid (EDTA) confirmed the enzyme as a serine metalloprotease. The enzyme had highest compatibility with Sunlight, a commercial laundry detergent. The characteristics of purified protease from B. brevis MWB-01 reveal the enzyme as a thermotolerant serine alkaline metalloprotease compatible with detergent formulation aids. Results suggest that protease from B. brevis MWB-01 is a good bioresource for industrial applications. Proteases have a variety of applications in detergent, pharmaceutical, leather, and food industries –. Globally, proteases constitute the largest product segment of industrial enzymes, accounting for about 60% of the total worldwide enzyme sales ,. Bacterial proteases are the most widely exploited when compared with fungal, plants, animal, and fungal proteases because of their extracellular nature and high yield of production; however, their usefulness is limited by various physicochemical factors, such as enzyme instability at high temperatures, extreme pH, presence of organic solvents, anionic surfactant and oxidizing agents, and need for co-factors . Ideally, alkaline proteases used in detergent formulation should demonstrate high level of activity and stability over a broad range of pH and temperature, possess broad substrate specificity and be active in the presence of detergent ingredients, such as surfactants, bleaching agents, fabric softeners, and other formulation aids . Hence, it is imperative to search for new alkaline proteases with desirable properties for commercial viability from various bacterial sources. Recently, we reported purified thermostable alkaline proteases from Bacillus licheniformis LHSB-05 isolated from hot spring  and Bacillus coagulans PSB-07 isolated from poultry litter site . In this present study, 21 proteolytic Bacillus species isolated from organic waste sites were identified and Bacillus brevis MWB-01 was selected based on zone of clearance on casein agar. B. brevis produced protease under submerged conditions and the protease was purified and characterized. This paper presents characteristics of alkaline protease from B. brevis MWB-01 which demonstrate the viability of the enzyme as good bioresource for industrial applications. Sephadex G-200, bovine serum albumin (BSA), ethylene diamine tetra acetic acid (EDTA), casein, β-mercaptoethanol, phenyl methyl sulphonyl fluoride (PMSF) and media components were products of Sigma-Aldrich, St Louis, MO, USA. All other chemicals used were of analytical grade and obtained from Fisher Scientific (Waltham, MA, USA). Commercial laundry detergents used were Omo and Sunlight from Unilever (Rotterdam, Netherlands); Ariel was a product of Procter and Gamble (Cincinnati, OH, USA). Sub-soil samples were collected aseptically from organic waste sites which included beds of effluent treatment plants of selected brewery, dairy and food industries, drainage from abattoir, poultry litter site and locust bean processing farm in the south western part of Nigeria for the preparation of initial culture. These were sub-cultured to obtain pure isolates of Bacillus species using the method of Aslim et al. . The Bacillus species were identified based on methods described in Bergey's Manual of Systematic Bacteriology ,. The identified bacterial isolates were plated onto casein milk agar plates and were incubated at 37°C for 24 h. 15% HgCl2 in 20% HCl was added to the plates and examined for clearing zone around the bacterial growth. The diameter of the zone was measured in millimeters. A clear zone of casein hydrolysis gave an indication of protease-producing organisms. Depending on the zone of clearance, B. brevis MWB-01 was selected for further studies. Production of protease from Bacillus brevis MWB-01 was carried out in a culture medium containing the following: 0.5% glucose, 0.75% peptone, and 5% salt solution made up of 0.5% MgSO4.7H2O and 0.1% NaCl, maintained at 37°C for 72 h in a shaking incubator (180 rpm). At the end of each cultivation period, the broth was centrifuged at 10,000 rpm at 4°C for 15 min. The cell-free supernatant was collected as crude enzyme preparation and subjected to purification procedures. Extracellular protease activity was determined using a modified procedure of Fujiwara et al. with 1.0% casein in 50 mM Tris-HCl buffer pH 8.0 as substrate. The assay mixture consisted of 0.4 ml of substrate and 0.1 ml of enzyme solution in 50 mM Tris-HCl buffer pH 8.0. The assay mixture was incubated at 40°C for 30 min and reaction was terminated by the addition of 2.5 ml of 10% (w/v) trichloroacetic acid (TCA). The mixture was allowed to stand for 15 min and then centrifuged at 10,000 rpm for 10 min at 4°C to remove the resulting precipitate. Protease activity was determined by estimating the amount of tyrosine in the supernatant which was done by measuring the absorbance at 280 nm. One unit of protease activity was defined as the amount of enzyme required to release 1 μg of tyrosine per milliliter per minute under the specified assay conditions. The cell-free supernatant was fractionated by precipitation with ammonium sulphate of 80% saturation. The precipitated protein collected by centrifugation was dissolved in 50 mM Tris-HCl buffer pH 7.5, and dialyzed against the same buffer at 4°C with three buffer changes, each for 12 h using Spectra/Por dialysis membrane (MWCO 3,500; Serva, Heidelberg, Germany). The resulting dialysate was centrifuged at 10,000 rpm, 4°C for 15 min, and the supernatant was applied on Sephadex G-200 (1.5 × 24 cm) column (Sigma-Aldrich, St Louis, MO, USA) equilibrated with 50 mM Tris-HCl buffer, pH 7.5. The column was eluted at a flow rate of 0.5 ml/min. Protease activity was assayed in all eluted fractions. The fractions (25 to 27) with high protease activity corresponding to the highest peak on the chromatogram were pooled, and subsequently used for characterization studies. The concentration of protein during purification studies was determined by Bradford method . The optimum temperature of purified protease was determined by measuring enzyme activity at varied temperatures (30°C to 70°C). The reaction mixture was incubated at respective temperatures for 30 min before determining protease activity according to the standard assay procedure earlier described. Thermal stability was determined by measuring the residual protease activity after 30 min and 60 min of pre-incubation of purified enzyme at temperatures ranging from 30°C to 70°C in 50 mM Tris-HCl buffer pH 8.0. Effect of pH on activity of protease was determined by assaying for enzyme activity at different pH values ranging from 4.0 to 12.0. The pH was adjusted using 50 mM of the following buffer solutions: sodium acetate (pH 4.0 to 5.0), sodium citrate (pH 6.0), Tris-HCl (pH 7.0 to 8.0) and glycine-NaOH (pH 9.0 to 12.0). Reaction mixtures were incubated at 40°C for 30 min and the activity of the protease was measured. To determine the effect of pH on stability of protease, the purified protease was incubated in relevant buffers of varying pH (4.0 to 12.0) without substrate for 60 min at 40°C. The residual protease activity was determined as previously described. Effect of inhibitors (phenylmethylsulphonyl fluoride [PMSF], β-mercaptoethanol [β-ME] and ethylene diamine tetra acetic acid [EDTA]) at 5 mM on protease activity was determined by pre-incubating the purified enzyme solution with inhibitor for 30 min at 40°C before the addition of substrate following the standard assay procedure. 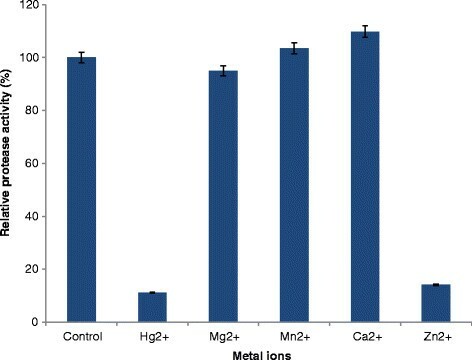 The effects of metal ions on enzyme activity (Ca2+, Mg2+, Al3+, Mn2+, Zn2+, and Hg2+) at 5 mM was investigated by pre-incubating the purified protease with each of the metallic chlorides without substrate for 30 min at 40°C. The residual protease activity was measured as previously described. Substrate specificity of purified protease from B. brevis MWB-01 was studied by examining proteolytic activity on protein substrates. The substrates studied were casein, bovine serum albumin (BSA), egg albumin, and gelatin. Purified protease (0.5 ml) was added to 2.0 ml of 50 mM Tris-HCl buffer pH 8.0 containing 1% substrate. After incubation at 40°C for 30 min, the reaction was stopped by adding 2.5 ml of 10% TCA. Protease activity was determined by following the standard assay procedure. The compatibility of B. brevis protease with commercial laundry detergents, Sunlight (Unilever), Ariel (Procter and Gamble), and Omo (Unilever), was studied. The effect of 5 mg/ml of each detergent on the stability of purified protease was determined. The diluted detergent solution was heated to 60°C for 1 h to denature the enzymes present in the detergent and left to cool at room temperature for 1 h. The purified protease was incubated with the diluted detergent for 1 h at 40°C and the residual activity was determined. The enzyme activity of the control was taken as 100%. Twenty one Bacillus species were isolated and identified using the culture, motility, morphological, and biochemical parameters (Table 1). All the species exhibited varying degrees of zones of clearance on 10% casein agar. The proteolytic activity was detected by the presence of a clear zone which indicated casein hydrolysis. B. brevis MWB-01exhibited the highest clearance zone measuring average diameter of 35.0 mm (Figure 1). Zone of clearance of Bacillus species on casein agar. Proteolytic activity of isolated Bacillus species was detected by the presence of a clear zone which indicated casein hydrolysis. Symbols and bars represent mean values and standard deviations of triplicate determinations. The protease was purified from soluble dialysate by gel filtration chromatography as described under methods section. 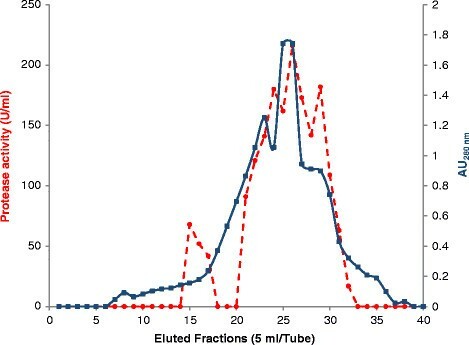 The chromatogram shows that the protease was eluted as a single major peak (Figure 2). Fractions (25 to 27) with protease activity (Figure 2) were pooled and concentrated for characterization studies. The purification procedure is summarized in Table 2, showing that the enzyme was purified 2.1-fold with a specific activity of 54.2 U/mg protein after Sephadex G-200 gel filtration chromatography. The yield of the enzyme after purification was 4.6%. Protease activity in eluted fractions vs chromatogram of alkaline protease from Bacillus brevis MWB-01. The activity of the purified protease from B. brevis was determined at different temperatures ranging from 30°C to 70°C. The optimum temperature for the activity of the purified protease was 40°C with 50% relative activity at 50°C (Figure 3). This is really unusual and surprising since some previous reports on proteases from Bacillus species have temperature optima of 50°C to 60°C ,–. The result obtained from the present study is however similar to those of reports by Feng et al. and Park and Cho  on proteases from Bacillus pumilus strain and Bacillus sp. JSP1 which had optimum temperature of 40°C. Banerjee et al. reported a protease from a strain B. brevis isolated from hot springs which had optimum activity at 60°C. The B. brevis under study was isolated from a mesophilic environment (beds of effluent treatment plant of a dairy industry). The observed difference in characteristics between same species of Bacillus might be strain related  and can also be attributed to the critical role which the source of isolation plays in determining the function of microbial species ,. A decrease in relative activity of purified protease under study above 40°C might be due to the autolysis or denaturation of the enzyme at higher temperature . The purified protease from B. brevis MWB-01 uniquely demonstrated 63% relative stability at 60°C after 30 min of preincubation at this high temperature in the absence of Ca2+ (Figure 3). 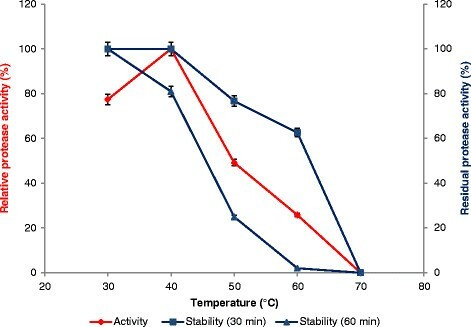 It is very interesting that this purified protease exhibited good thermal stability despite a lower optimum temperature. Effect of temperature on activity and stability of purified protease. The purified protease had optimum pH of 8.0 and was active over a broad pH range of 5.0 to 12.0 exhibiting above 70% relative activity at pH 9.0 to 11.0 and about 54% relative activity at pH 5.0, 6.0, and 12.0, respectively (Figure 4). This is a very remarkable characteristic of purified protease from B.brevis MWB-01 considering reports on some proteases that have higher optimum pH but relatively low activity at pH values below and above the optimum pH Asker et al. reported an alkaline protease from Bacillus megaterium with optimum pH of 7.5 which showed relative activity of 8.0% and 10.0% at pH 5.5 and 9.0. Genkal and Tari  also reported an alkaline protease from a Bacillus sp. with optimum activity at pH 11.0 and low relative activity of 20% at pH 13.0. Bacillus pseudofirmus AL-89 had optimum pH of 11.0 and showed low activity at pH values below pH 10 and above 11.5 . High alkalinity is a desirable characteristic for proteases used in detergent formulation ,. 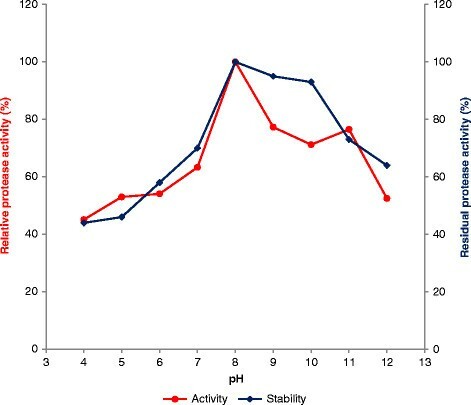 Studies on pH stability showed that the enzyme was very stable in the pH range of 7.0 to 12.0 with above 60% residual protease activity (Figure 4). It is quite interesting that the purified protease had residual activity of 93% at pH 10.0 and 64% at pH 12. The protease from the strain of B. brevis MWB-01 under study distinctively demonstrated higher stability over a broader pH range of 6.0 to 12.0 than the previously reported protease from another strain of B. brevis which had optimum activity at pH 10.5 . This exhibited characteristic by protease from B. brevis MWB-01 is of crucial importance in determining the suitability of proteases for use in detergents especially in ultrafiltration membrane cleaning which requires activity of protease over a broad pH . Effect of pH on activity and stability of purified protease. All the inhibitors tested at 5 mM inhibited the protease (Table 3). PMSF inhibited the protease activity by 91.7% which suggests that the purified protease from B. brevis MWB-01 is a serine protease. PMSF sulphonates the essential serine residue in the active site of the protease and has been reported to result in the loss of enzyme activity . β-ME inhibited protease activity by 90.4% which shows that the purified protease is not a cysteine protease which is activated in the presence of β-ME. Inhibition of the protease by β-ME might be due to denaturation of the enzyme resulting from cleavage of at least one disulfide bond that is critical to the stability of the protein and maintenance of the enzyme in its active form . The enzyme lost 92.5% of its original activity in the presence of EDTA which infers that EDTA chelates metal ions at the active site of the purified protease which possibly serve as cofactors for the protease  confirming the enzyme is a metalloprotease. The protease activity was enhanced in the presence of Ca2+ and Mn2+ with 110% and 103.5% residual activity respectively above the control (Figure 5) which indicates that these metal ions play an important role in maintaining the active site conformation of the purified protease . This is similar to some previous reports on alkaline protease from Bacillus species which were activated in the presence of Ca2+,,. However, Hg2+ and Zn2+ strongly inhibited the activity of the enzyme with 89% and 86% loss in activity when compared with the control. Effect of metal ions on activity of purified protease. The purified protease exhibited highest level of hydrolytic activity on casein which was used as control. The enzyme hydrolysed bovine serum albumin and egg albumin showing relative activity of 74.5% and 63.2%, respectively (Table 4). Gelatin and collagen were poorly hydrolysed with relative activity of 18.4% and 4.1%, respectively. Earlier reports revealed that alkaline proteases showed highest activity towards casein relative to other proteins like BSA, gelatin ,–. Hydrolysis of various substrates has been reported as one of the important criteria for selection of proteases for application in laundry detergent formulation . Purified protease from B. brevis MWB-01 was stable in the presence of tested commercial laundry detergents, Omo and Sunlight with relative residual activity of 76% and 40%, respectively (Table 5) in the absence of CaCl2 and glycine. Similarly, protease from B. amyloliquefaciens PFB-01 retained above 60% of its original activity in the presence of Omo . The detergent compatibility of alkaline protease from B. brevis MWB-01 in the absence of Ca2+ and glycine is particularly novel considering reports on similar studies that used Ca2+ and glycine to enhance detergent compatibility of the alkaline proteases studied ,. Purified protease from B. brevis MWB-01 was least stable in the presence of Ariel with relative residual activity of 11%. The demonstrated detergent stability of protease from B. brevis MWB-01 infers that the enzyme had good compatibility with ingredients present in detergent formulation. The characteristics of purified protease from B. brevis MWB-01 reveal that the enzyme is a thermotolerant serine alkaline metalloprotease which is compatible with detergent formulation aids. These results suggest that protease from B. brevis MWB-01 is a good bioresource for industrial applications. This research was supported by the International Foundation for Science, Sweden through research grant (F/3775-2) to Dr. Folasade M. Olajuyigbe. The authors gratefully acknowledge the contribution of Mr. S.O. Olatope and other technical staff of Biotechnology Unit, Federal Institute of Industrial Research Oshodi (F. I. I. R. O), Lagos, Nigeria in the identification of bacterial isolates. FMO conceived and designed the study and analyzed and interpreted the acquired data. AMF carried out the purification and characterization studies. Both authors participated in writing the manuscript and read and approved the final manuscript.